DNA replication is regulated at the initiation step. Research of the project group Biochemistry focuses on DNA replication and maintenance of genomic integrity in aging and age-related diseases. We study mechanisms of DNA replication, repair and damage response, and the consequences of dysfunction of these processes. DNA replication, the duplication of the genetic information is a fundamental process in all living cells. Accurate and complete DNA replication is a prerequisite of successful cell division and growth. Therefore, not surprisingly, DNA replication has evolved as a process with amazing plasticity and fidelity. It is further supported by many DNA repair processes and DNA damage response that repair DNA damages in an optimal way. Nevertheless, over time errors during DNA replication slowly accumulate and lead to cell and tissue malfunctions that underlie aging and cancer. This is a particular problem for large and long-living organisms such as humans. How do hereditary mutations in genes of the BRCA pathway lead to early onset of breast cancer? And how does the imbalance between DNA replication and recombination contribute to genomic instability? Breast cancer is the most common malignancy in women in industrial countries. Heterozygous mutations in several genes increase the risk and decrease the age of onset to develop breast cancer. Most of the prominent breast cancer genes are involved in the BRCA pathway that regulates homologous recombination after DNA double strand breaks and during DNA replication. We have previously shown in Finnish carriers of a PALB2 mutation that already loss of one of the two copies of this genes leads to a replication stress phenotype as well as defects in the maintenance of cell cycle checkpoints that together lead to genomic instability and is thereby an early driver of cancer (Nikkilä et al., 2013; Obermeier et al., 2016). In collaboration with German and international partners we study the functional consequences of several other hereditary breast cancer mutations. In a DFG-funded project, we study specifically, what are the effects of reduced dose of factors involved in the BRCA pathway on DNA replication, homologous recombination, DNA damage response and genomic stability. A heterozygous mutation in the breast cancer gene PALB2 leads to disturbed DNA replication and genomic instability. How does DNA replication stress promote genome destabilisation? DNA replication stress has been identified as a key factor leading to genomic instability and cancer. The number of DNA replication rounds of stem cells in the body and thus the age represent a main determinant of the risk to acquire cancer. The causes of DNA replication stress are manifold as are the phenotypes associated. 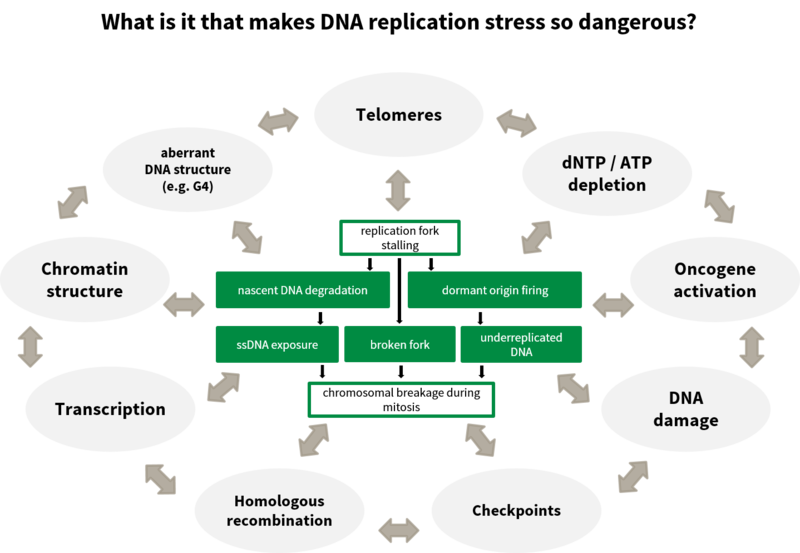 We have looked at various causes of DNA replication stress such as disturbances of DNA replication (Köhler et al., 2016; Sokka et al., 2018), homologous recombination (Nikkilä et al., 2013; Parplys et al., 2015), DNA damage tolerance (Hampp et al., 2016) as well as metabolic disturbances (Pai et al., 2016), to broaden the understanding of the causes, the phenotypes and the subsequent effects of DNA replication stress. DNA replication stress has been identified as a major cause of genome destabilisation. It reasons are manifold. What are the limits of mutation rates in human cells and how can mutation rates be control during aging and cancer? In a more recent line of research we look at the rates of mutations during DNA replication in human cells. We try to define the limits of mutation tolerated by human cells, and the specific characteristics of cells with very high mutation rates. We also look into how mutations accumulate during aging and how organisms with different life expectancy differ in their mutation rates. Finally, we explore new ways how mutation rates can be influenced positively and negatively in the treatment of cancer and the possible alleviation of mutation accumulation during aging. What are the molecular functions of individual replication proteins? A longstanding research interest of our project group is the characterization of factors involved in DNA replication and recombination. These include replicative DNA polymerases α, δ and ε (Vaara et al., 2012; Villani et al., 2014; Itkonen et al., 2016), helicase co-factor CDC45 (Szambowska et al., 2014, 2017; Köhler et al., 2016), DNA helicase RecQL4 (Ohlenschläger et al., 2012; Keller et al., 2014) and S100A11 (Foertsch et al., 2016). Recently, we identified a new potential replication factor designated PN70, which is currently functionally characterized in detail.